First: 이도류의 숙련도 15%, 명중률 1 상승. Last: 이도류의 숙련도 60%, 명중률 20 상승. Fiel's Note: Not sure on this one. I'm really guessing here. This is an active skill, not passive. 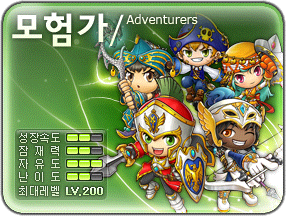 Also, level 8 is Nexon's problem and not mine. They missed it. 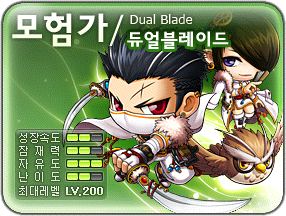 Fiel's Note: This skill has a rush-like effect. All mobs affected by this skill are pushed with you. Fiel's Note: In the data, this skill largely resembles Pierce. Some parts of this skill do not make sense to me. Fiel's Note: Scorpion says "GET OVER HERE!" Last edited by Fiel; 2010-07-25 at 10:51 AM. 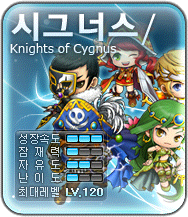 nice , really looking forward to seeing the name of the skills and the info about them . 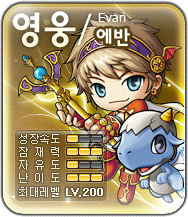 im hoping the fact that their potential and difficulty is level 2 does not mean they will be weaker compared to aran and evan. 19MB doesnt seem that much. I wonder if this means that if you are using just one weapon these skills dont apply...not that you would not be using two weapons all the time. I think the Skills from CS only applies to the Test Server to make it easier to you know, test...well I hope that is the case. that's a lot better than Savage blow (i guess that's okay, i mean it's FATAL, not savage). Looks like fun. Guess this'll be my shadower, since I've always wanted one but never had any reason to beyond CPQ mule (then i over leveld >.>). I'm expecting a 90% mastery skill and a critical in store. Anyway, thanks for this as always, Fiel. 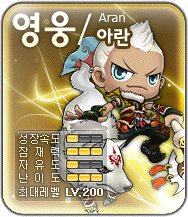 Fiel can you please add the level for each job. Cool! Where is the owl skill though? off topic? Anybody know the japanese word for 2 sword? I think it begins with a Y.
I'm gonna guess it's a 5th or 6th job skill..